A new form of accounting statement - the value added statement - is gaining popularity in the corporate annual reports of the largest companies in the UK. This statement can be viewed as a modified version of the income statement because, like the income statement, the value added statement reports the operating performance of a company at a given point in time, using both accrual and matching procedures. Unlike the income statements, however, it is interpreted not as a return to shareholders but as a return to the larger group of capital and labour providers. 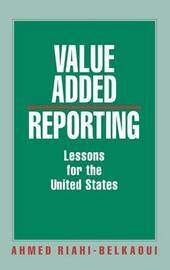 The author shows that the value added statement can be easily derived from the income statements and is therefore easily adaptable to the needs of US companies. 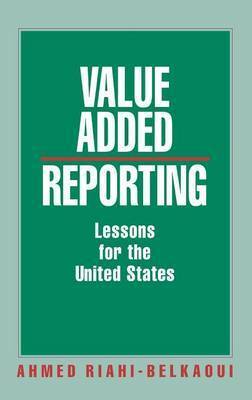 To illustrate the usefulness of the value added statements, this book devotes the first chapter to a thorough discussion of its many benefits. The book then analyses the usefulness of the value added statement in understanding the characteristics of corporate takeovers in the US. AHMED RIAHI-BELKAOUI is Professor of Accounting at the College of Business Administration, University of Illinois at Chicago, and Chairman of the Cultural Studies and Accounting Research Committee, American Accounting Association (Internal Accounting Section). He is also a member of the editorial board of several professional journals and is the author of sixteen previous Quorum books and co-author of two more.